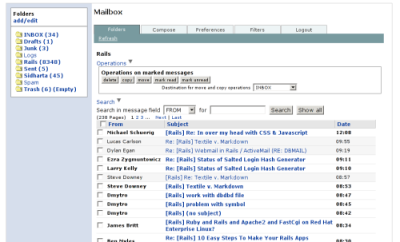 Mailr is an open source webmail application written in Ruby which uses Ruby On Rails web application framework. The application is tested with Courier-IMAP and Dovecot but it should be possible to use it with any other IMAP server. Mailr is free and unencumbered public domain software. For more information, see http://unlicense.org/ or the accompanying UNLICENSE file.